Hello support pardon my english i killing myseft since 1 day to access submit ads in classiera; i don’t see how to do this please give me your help please !! Here is my site: http://louersonappartement.com/homepage-v2/ what is the good link for Submit ads ? when i enter : /submit-ads/ as you recommend in the documentation i have mistake ! Please don’t abandonned me ! My last thing is i would like this page /homepage-v2/ ) as home page ! but more important for me is my firt ask! Thank a lot support for your help! As I see you are using the Classiera – Classified Ads WordPress Theme. Because you purchased that theme your purchase comes with 6 months support included. The support is provided by the seller of the theme. 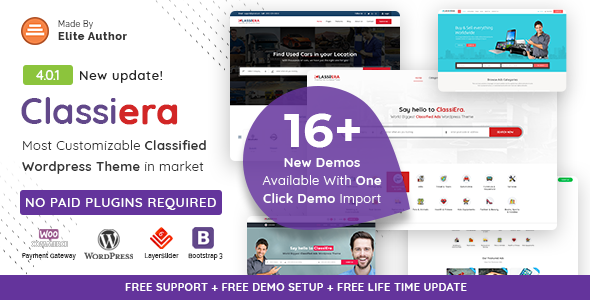 Ask the seller in a comment here Classiera – Classified Ads WordPress Theme . It will be the most suitable to give you assistance with your problem. Select from the dropdown “A static page”, the page you want to have one as homepage. All my gratitude ThemeSLR ! sincerly it is my first wordpress and is not easy for me !! i am happy for your answer! You need to contact on support. If you have any problem. I use the classpress theme for 5 years on my website (kiralikismakinesi.com) which is WordPress system. Now I bought a new br theme called classiera, but I have difficulty loading it. How can I upload a classiera theme without missing members, postings, postings and other content on the web?